Last night, Sabrina was in charge of the potatoes for dinner. 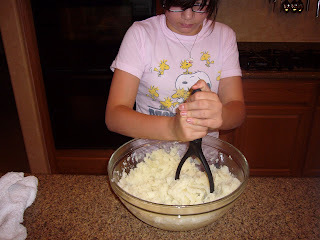 She decided to make regular mashed potatoes but added horseradish to spice things up a bit, and put the potatoes into a pie pan to make a "pie" of sorts, but really, she just likes the crispy crust on the top! 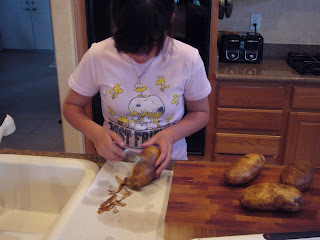 So first, she peeled the potatoes - russets work best. We learned the hard way not to put the potato peels down the disposal - so she peeled them onto a paper towel! 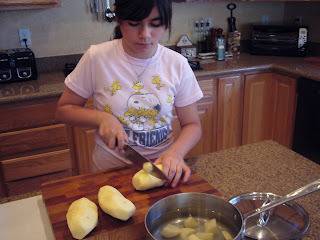 Then, she cut them into medium sized chunks - after they were cut she put them in the saucepan filled with water so the potatoes wouldn't turn brown. Cook the potatoes until tender - it took about 25 minutes. 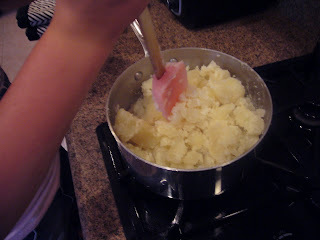 After they are cooked, drain the water, keeping the potatoes in the pot, and return them to the cooktop, stirring over medium low heat, the help "dry out" some of the water so the potatoes aren't mushy. Now pour the potatoes into a large bowl and start mashing. At this point, we added 4 tablespoons butter, 1/2 cup of milk, a pinch of salt, black pepper, 3 tablespoons of sour cream and 2 teaspoons horseradish. Keep mashing until you get the desired consistency. We like ours chunky so she didn't get too crazy with the mashing. 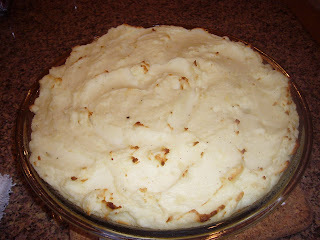 She sprayed a 9" pie pan with Pam, and spread the potatoes into the dish. Bake at 375 degrees for about 25 minutes, or until the top is nicely browned. If you look closely into the middle, you can see the heart-shaped design she made!! I too learned the lesson of the potato peels the hard way. If you are peeling a bunch of eggs, the same thing happens with the egg shells!